Tuesday was KBS Day! I’m not usually off on Tuesday, but I worked a double shift last Sunday, so I took Tuesday off so I would get two days off this week. It just worked out for me that my ticket for the KBS release was Tuesday. I was originally going to have to make two trips to Grand Rapids because I didn’t want a couple four packs of beer in my car all day while I was at work. Since I was off, I only had to make that one trip and it took my quite a while to get home. I was pretty stupid and didn’t go inside the taproom at Founders to enjoy any of their taproom only specials. Instead, I headed over to the Downtown Market to pick up some popcorn from Dorothy & Tony’s for J. Almost as soon as I got back in the car, I got a call asking if I’d stop at The Cupcake Zoo in Otsego to pick up a couple cake pops. I figured what the hell. I didn’t have to be home for anything, so I made that stop as well. After a stop at the Meijer in Plainwell, I noticed I was getting hungry. I didn’t really have a plan, but I was thinking of a couple places I’ve driven by recently that I haven’t been to. My choice is a small shop on the Northside of Kalamazoo that has gone through several different restaurants. It’s been a BBQ joint, a chicken restaurant, and a Soul Food place that I’m aware of, but now it’s serving up Egyptian Food. 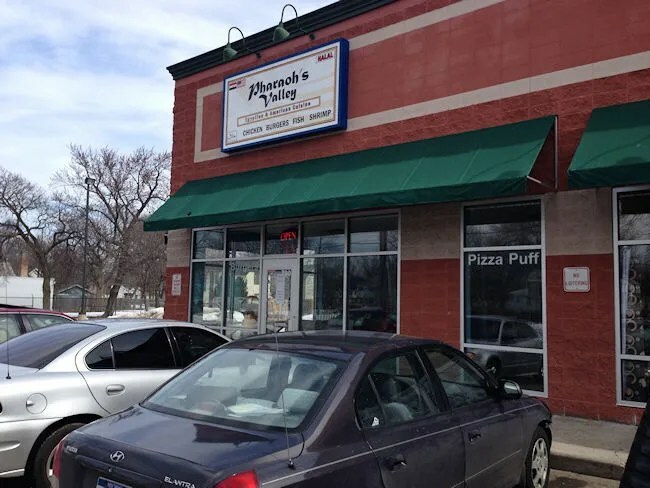 Pharaoh’s Valley is in the North Point shopping center at the corner of North Westnedge and West North Street in the Northside Neighborhood. It takes up the corner space furthest to the north. The last time I ate there the restaurant was known as T-N-T Touch of Soul, but that was several years ago. The restaurant is a little different than I remember it. There is some seating inside what could be a pretty good sized dining room for the size of the space, but it appears most people do take out. There’s an order counter in the back corner which opens up in to the kitchen. Surprisingly, there was no menu posted anywhere. I noticed a paper menu on a nearby table, so I grabbed that to look over until the lone cook noticed me standing there. The Egyptian side of the menu didn’t really do anything for, but there was some fried food options on the menu and I gravitated towards that. I went with a selection off the Combo section of the menu. 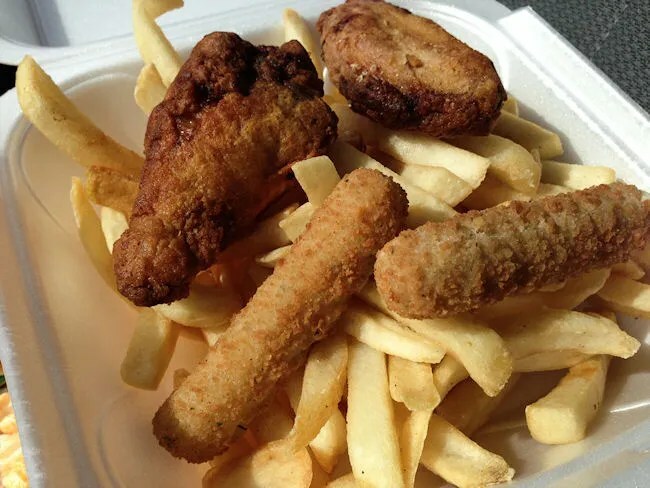 It’s listed as Wings and Mozzarella on the menu and it includes two wing dings and two mozzarella sticks with fries and a drink. It doesn’t sound like a lot of food, but the cost is only a little over $5.00 and what they lack in wings and sticks, they make up for in fries. I took a seat after paying the bill with cash although they do accept credit. It took about ten minutes as all of the fried foods needed to be fried up fresh. Once my meal was boxed up, I was asked about a drink and I chose Pepsi. It was a fountain drink that was filled behind the counter. I grabbed the to-go container and started to head home, but I was pretty hungry at this point, so I popped the box open and started digging in to the fries. There was a lot of them, but they were run-of-the-mill food service fries that didn’t even have any salt on them. Didn’t stop me from eating them, but they were really nothing special. I ate the mozzarella sticks next because I still wasn’t home yet and mozzarella sticks are easy to eat in the car….especially when there’s no marinara to dip them in. Again, these had the taste of out-of-a-bag food service mozzarella sticks. I waited for the two wings until I got home. Unlike the other items in the box, these actually did have a little flavor to them. They were nice and crispy with a pretty decent seasoning to the skin. The wings were juicy while the outside was very crispy. Pharaoh’s Valley is what it is. I don’t know how authentic of an Egyptian place it is, but my guess a lot of that is food service stuff as well. It’s one of those places that it’s nice if you live close to it, but it’s really not worth going out of your way for. 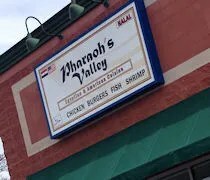 If you’re in the area and you want a decent, cheap place, Pharaoh’s Valley will take care of that for you.